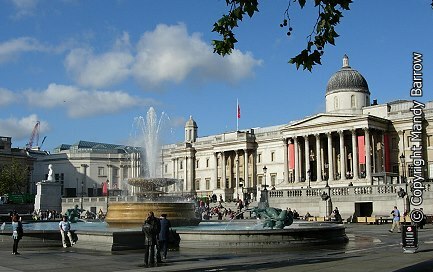 Trafalgar Square is a public space and tourist attraction in central London. How did the Trafalgar Square get its name? 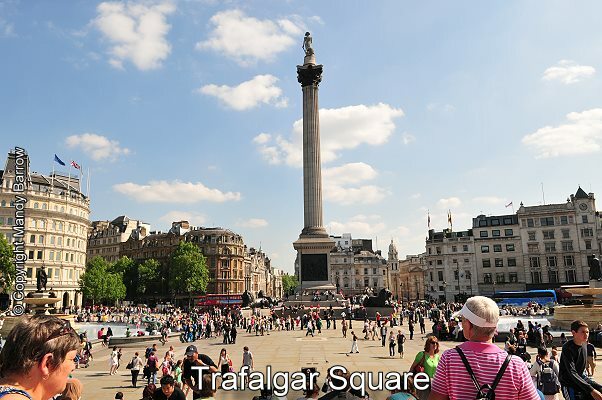 The Square is named in honour of the British victory, led by Admiral Lord Nelson, at the Battle of Trafalgar in 1805. From the 14th to the late 17th century, much of the area occupied by Trafalgar Square was the on the site that was originally the Royal Mews where royal hawks were kept during moulting (or ‘mew’ time). In the 1730s, the area was used for Royal stables, which served Whitehall Palace. Whose column can we see at Trafalgar Square? 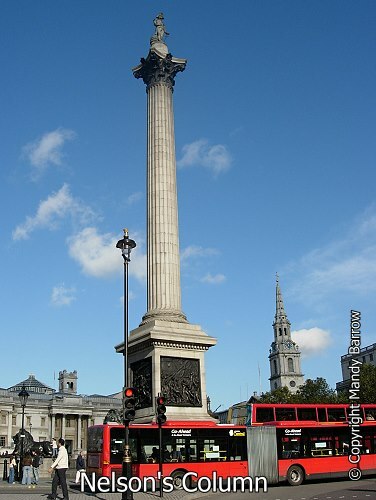 Dominating the square is the 56 m (171 feet) column, Nelson's Column, with its 5.5m (18 feet) statue of Nelson on top. It was erected in 1843. Nelson faces south, towards Whitehall, Westminster Abbey, the Houses of Parliament and the River Thames. South west is Admiralty Arch, the entrance to the wide ceremonial drive to Buckingham Palace called The Mall. 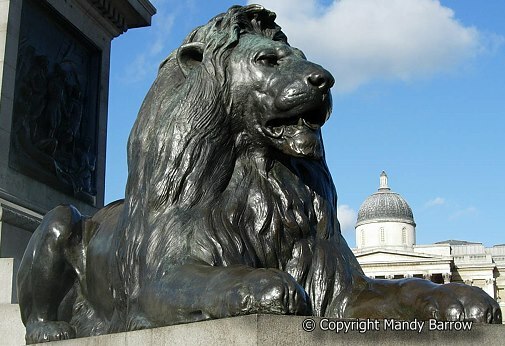 Nelson's column is guarded by four huge bronze lions sculpted by Sir Edwin Landseer in 1868. The four lions are rumoured to have been cast from melted down bronze cannons, reclaimed from old battleships (possibly from the French fleet). Norway always sends a huge Christmas tree that stands in the square, as a token of gratitude for Britain's help during the Second World war. The tree given is between 60-70 feet tall and is decorated with approximately 500 white lights. If you want to see the lights on the tree switched on, this always happens on the first Thursday in December. It was founded in 1824 when George IV persuaded the government to purchase 38 major paintings, including works by Raphael and Rembrandt. To the west lies the West End, with its famous shops and hotels. To the east is the Strand, which leads to the City of London. In 1876 the Imperial Measures were set into the north terrace wall. Surveyors can still check ‘Perches’, ‘Chains’ and other archaic measures against feet and yards. 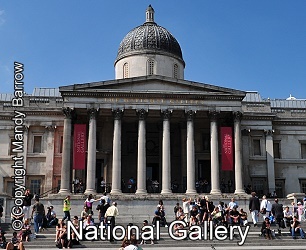 When the central staircase leading to the National Gallery was added, the measures were relocated to the bottom steps. In the southeast corner of Trafalgar Square is a small former police phone box which is famous for being the World's smallest police station. head-quarters of the London Metropolitan police. The lantern lamp on its roof is said to be from Nelson’s flagship Victory, although there is no evidence that this is true. Today the police box is used as a broom cupboard for Westminster Council cleaners. 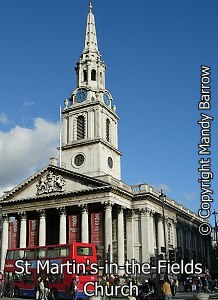 To the east of Trafalgar Square is the 18th century St Martin's-in-the-Fields church. The first church built on this site in the 13th century stood 'in the fields' between the City and Westminster. Many famous people have been buried at St Martin's including Nell Gwynn, mistress of Charles II , the painters William Hogarth and Joshua Reynolds and the renowned craftsman Thomas Chippendale. What time is it now in England? After visiting Trafalgar Square walk through Admiralty Arch and into the Mall. You can walk down the Mall to Buckingham Palace. 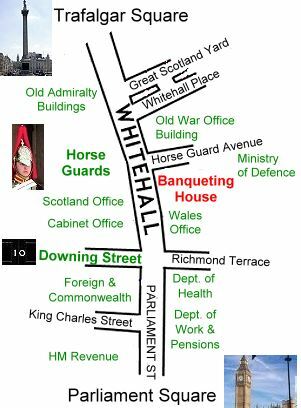 Or walk down Whitehall (see map below). Hover over and click on the labels on the map.